What is the Airguard ? It is quite common for military installations, including ships and vehicles, to be equipped with CBRN (Chemical, Biological, Radiological and Nuclear) defence systems. Such systems use special filters in conjunction with fans to supply and clean air from the outside to keep internal personnel safe from exposure to airborne threats. The Airguard was designed (in the wake of 9-11) to provide the same level of personnel protection to civilian installations with a portable system at a much lower cost. 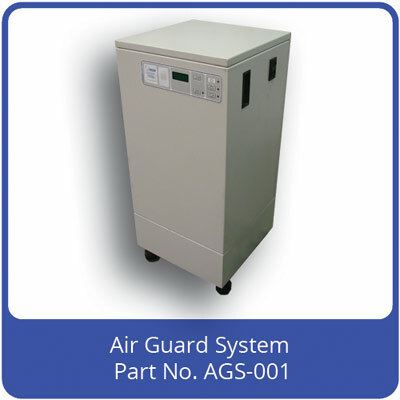 The Airguard is similar in size to a domestic dehumidifier or air conditioning system, and just as simple to operate. The Airguard is primarily designed for Civilian applications. These might include: Civil Defence, Local Government, Police, Fire and Hospital installations. The Airguard, due largely to its simplicity of operation and low cost, is also suited to domestic dwellings and commercial vehicles. The Airguard works similarly to its military counterpart. HEPA and defence grade carbon filters in conjunction with a fan supply air from the outside to over-pressure the internal environment. The over-pressure ensures no inward leakage whilst the filtration cleans the ventilation air of any airborne hazards. An internal battery ensures the system can continue to provide protection even if the local mains supply goes down. The Airguard would typically be operated at times of tension to protect personnel in designated rooms or enclosures. The Airguard provides the same level of CBRN protection as its military counterpart, using defence grade filters and other commercially available components. The unique instrumentation and control system displays room over-pressure allowing leaks around doors and windows etc to be taped up, so improving protection. Once the optimum over-pressure is reached, the automatic fan control system reduces the fan duty as sealing continues, to maintain the room pressure constant. This has the effect of increasing the internal battery run-time, and so improving protection. Due to the use of commercially available components, and no requirement to test to defence/military standards, the Airguard is available for a fraction of the military system cost. The Airguard requires no export licence so can be supplied world-wide. Low cost - ideal for domestic use.